In November, 2011, I went to Fond des Blancs, Haiti for 10 days to help make it more beautiful. I left later full of the pride and gentleness of the beautiful people who live there. "Let's make Fond des Blancs Beautiful" is a rural relocation project of the St. Luke's program, Nos Petits Freres et Souers, Port aux Prince, Haiti. Ferel Bruno, a grand frère himself is the glue that binds NPFS and Fond des Blancs, the village of his birth. Due to his years of experience working with NPH, he was able to respond to his brother's call for help as thousands of people from Port aux Prince returned to their home region of Fond des Blancs. They came back to find shelter, food, and work relying on extended family to take them in as their own families were fractured by the 2010 earthquake. I first met Ferel immediately after the earthquake when I went to transport food, medical supplies and teams from the Dominican Republic to Haiti. I returned to see for myself what progress they have made in the last 18 months. When I returned to Canada after my trucking trip to Haiti, we organized a donation of 135 shelter homes for NPFS. When I asked Ferel for a report on how the project was going, he challenged me to come see for myself and do my own report. This is it! "Dugue" is known as "The spot where the road crosses the river with clean water". On the surface it appeared that the first project was to build a water filtration system and cistern for clean water and later a help to combat cholera. In reality, his first project was to connect with local leaders to ask them the priority needs of their community. He let them know how NPFS works and how it can help them make Fond des Blancs beautiful - one step, one priority at a time. This connection is what I learned is the real reason why this project is successful. As Sister Judy, a 10 year veteran nurse of NPFS says "because (Ferel Bruno) is from the community, he knows what the community needs. He's had meetings with the community members. He has not done anything without finding out if the community wants it." Building the filtration system, a retaining wall along the river and road, and building up the road leading down and back up from the river where the next priorities identified. The hardware store and guest house came next and have become the central focus of town. With tin from Debert, a much needed youth center was built over the hardware store. To support these projects and create long term local jobs, it was decided that a cement block factory should be established. This cement block production has created 8 jobs, an income for the project, maintained ownership, quality control, and the capacity of contracting out for other projects. Each weekend when the truck from St Luke's arrives, it is used to haul water from the river to storage tanks at the cement building site. The cement and water are then mixed by hand and made into blocks, making up to 2,000 blocks a day. They could use a donation for their own truck for Fond des Blancs. The cement blocks have been used to build the new church. The construction team led by Lamarre employes 12 men. The new church is right beside the river and will be a good spot for baptisms, and a symbol of pride for the community. The next project I visited was the new corn mill to grind the kernels of grain. This helps local farmers who grow grain for their own food consumption. The ability to process their own grains locally helps farmers feed themselves and perhaps generate some income through sale of the surplus. The donkey parking lot is an indication that there is a line-up in the morning even before the mill starts. I have met the farmers of FdB... and I have met their husbands as well. For 50 cents per 20 litre pail they get their corn ground, saving lots of physical work and time. A screener to separate the flour from the meal to be able to use in the new bakery would be a logical next step. Again working with the community, Ferel and NPFS received some donated land and created a seed farm and tree nursery. Here farmers can get seed and nursery tree seedlings to plant corn, sorghum, beans, mango, avocado, bananas, plantain. The seeds and nursery stock help create incomes and food. The purpose of the fruit tree nursery is to encourage farmers to plant trees that will be valued for their fruit production and thus not cut down for firewood. It is part of the Fond Des Blancs vision for reforestation. Trees that produce an income are needed to combat the practice of tree cutting for charcoal production for income. Large tracks of land have been cut bare to make charcoal. Without trees, much of the fertile topsoil has been washed away. As an agrologist, it is discouraging to sit at the bakery in Dugue and watch truckloads of charcoal drive by heading for the city of PAP. Unfortunately until there are viable alternative incomes available this practice will continue. The people of Fond des Blancs have identified this as a need. Well done. Ferel helped with the building of a modest bakery. In October 2011 an Italian donation of a 20 foot container housing a state of the art 'bakery in a box" arrived. Besides making the best bread in the countryside, the bakery also employs four young adults full time. The bakery came complete with a power generator, so it has become an important public power supply to charge up our cordless power tools and cell phones. The staff of the St. Boniface Hospital, half an hour drive away in Sainthon rave about the "Best Bread from FdB". Fresh bread, fresh fruit, fresh coffee...I ate well. God is Good! The old bakery is now a sewing classroom equipped with 4 new treadle Finger sewing machines. While I was there I helped Andres build a few of the shelter homes we donated. This was our small contribution to the project. Building shelters was wonderful as I got to know my new neighbours. More of the sheet metal was used to build a temporary three room school and the foundations are being built for the new school. Even our forty foot shipping container has become a landmark in downtown Dugue. The latest project is the building of the Ste. Joan Margaret Medical Clinic in Lhomond. I admire their faith and courage. With one building up, a volunteer house, no furniture, equipment nor supplies, and no long term plans for staffing this clinic, the proposed four building medical centre is scheduled be opened Feb 25th, 2012. For the last year, Nurse Sister Carmel has travelled 1-1/2 hours from Leogane to see patients each Tuesday. The location of clinic was chosen as it is equidistant between Sainthon and Miragoanne, so it is as far from medical services as one can get, about 45 minutes in each direction. This community of 15,000 is equal in size to my hometown of Truro, Nova Scotia where we are currently building a new 150 bed hospital. It humbles me to compare the wants and needs of my 2 communities of FdB and Truro. The people of FdB are extremely humble and always willing to help and are share what they have. It reminds me of how my grandparents used to talk of the 'good old days'. I also learned that there is a large disconnect between the city of PAP and rural Haiti, very similar to Canada...keeping the youth in the rural communities is a challenge worldwide. 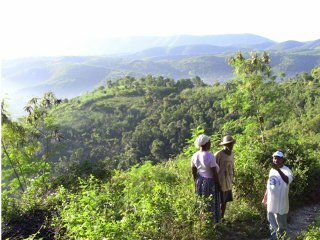 I went to FDB, Haiti to learn about the progress has gone in this rural project. Now I have my answer. I saw it for myself. They have done more with less than I could have imagined. The connection, listening and partnering that Ferel has done with this community has made it a success so far and I cannot wait to see their future grow. It is a passionate model of a successful rural community project and is indeed Making Fond des Blancs Beautiful.